The Community Resilience Cook book details that having elevated levels or cortisol and adreneline in the body for a prolonged period of time can cause elevated glucose levels. High levels of glucose can lead to type 2 diabetes. It also leads to a person’s blood pressure and cholesterol to be elevated. High blood pressure weakens the circulatory system and heart and high cholesterol can lead to heart attack and stroke. It also mentions that having too much cortisol in our bodies can lead to osteoporosis, depression, anorexia, arthritis, hyperthyroidism, gastrointestinal disease and a shrinkage in our lymph nodes which creates complications for our body to fight off infections. 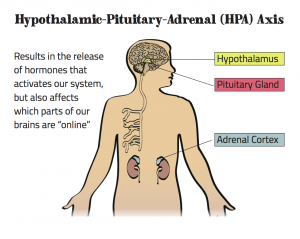 If the body experiences high levels of cortisol over many years in can lead to a break down in the immune system, which can result in the immune system attacking parts of the body which can result is diseases such as multiple sclerosis, fibromyalgia, lupus and rheumatoid arthritis. Even those these conditions aren’t usually attributed to children, the more traumatic their experiences the more it predisposes them to these health inequalities as an adult. When you are chronically stressed (in a constant state of arousal) experiencing an additional stressful event can produce (trigger) a somewhat exaggerated response compared to others. Many survivors of childhood trauma have a hypersensitivity to things such as smells, sounds, noises, tastes and touches. An un-predicted and accidental bump can send a traumatised child instantly in to a “fight, flight, freeze” state, which the child may retaliate with a bite or a punch, with running away or throwing chairs and even with a total withdraw and disassociation. 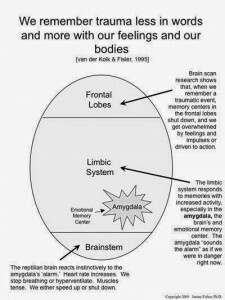 It’s these triggers that Doctors label these actions as reactions to post traumatic stress disorder (PTSD), PTSD could be classified as a social inequality, as the sufferer never knows when they are going to come across a trigger and if severe enough and if left untreated could lead to anxiety disorders such as agoraphobia. This leads me on to my next blog topic which is the effects trauma has on a social level. I enjoyed reading your post because I can relate what you say to my personal experiences as a child experiencing trauma and family violence. I can also say that there is a lot of truth in what you say about the “flight fight or freeze” response. Having experienced violence in a relationships an adult, the reaction was definitely instantaneous and invoked some strong emotions within myself. I feel that it is important to educate the public about the effects of trauma on children’s long term health and look forward to your next blog about the social implications of trauma. I found this topic fascinating mostly due to the fact that you have highlighted the possible lasting physical effects of childhood trauma. The results of medical research on the impacts of too much adrenaline and cortisol emphasises the importance of early intervention. I believe the holistic approach to any issue is the most successful in terms of providing long term outcomes. Therefore, I look forward to reading your dimension on the social impact of trauma. I would be interested to hear your views on successful programmes addressing these issues.